I’m still working on getting the best ramen — especially the best tonkotsu ramen — possible in this neck of the woods. It frustrates me so that you can get decent, if not downright good, ramen on just about every street in Japan, and cheaply, too! It’s generally not considered fancy food. But here it’s practically gourmet fare, hard to find, and expensive. So I’m still trying to make my own passable version. Overall, the best ramen broth I’ve made was shoyu ramen from page 8 of Simply Ramen by Amy Kimoto-Kahn (2016) (or her website easypeasyjapanesey.com. But my favourite type of broth is still tonkotsu, and to be frank it’s more than a little intimidating because there are so many steps that must be gotten just right. I’ve been trying to skip the cooking step on this one and just find a pre-made alternative, but I haven’t had a lot of luck. Last night I made another attempt at using a pre-packaged soup base. I couldn’t even read anything on the package except “tonkotsu ramen” (what can I say, it’s been twenty years since I took Japanese lessons), and I am still kicking myself for not taking a picture of the packaging. The base came in what was essentially a bag, and was fully liquid. As with many other such things, I bought it at T&T. The broth was okay I guess, but nothing spectacular. It was better than any of the dried kinds I’ve tried, but still not as good as the fast food places that I know for a fact use instant broth (I’ve watched them cook it). So yeah, nothing to write home about. The noodles, were a bit soggy and floury. I’ve used this brand before (Nissin Frozen Ramen Noodles), and at this point I’m just using up what’s in my freezer. I don’t plan on buying them again. The toppings, though, were really tasty. I made pork belly with soy sauce, a dash of sake, and a little bit of sugar. I think I could have gone a little bit lighter on the soy sauce (it was a little salty), but otherwise I liked this pork belly much better than the kind I have made in the past. I think what helped was that I browned it first, then added the liquids and let it simmer for a while. It really enhanced the flavour. 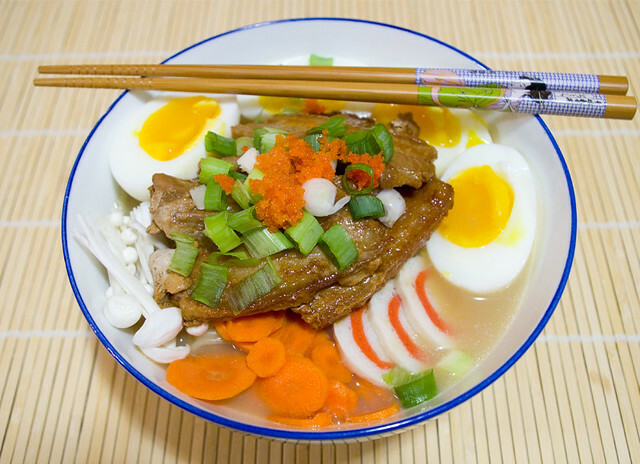 The other toppings included soft-boiled eggs, enoki mushrooms, thinly sliced carrot (made easy by using a veggie peeler instead of a knife), narutomaki (fish cake), green onion, and tobiko (flying fish roe). The toppings were tasty, complimentary, and easy to prepare. It’s getting to the point now where I think I had best just start making tonkotsu broth and ramen noodles from scratch in order to meet my own standards. I’ve wasted so much time trying to find decent pre-made ingredients when I’m starting to think that they’re just not available this side of the pond. I think the next step is investing in a pasta machine. 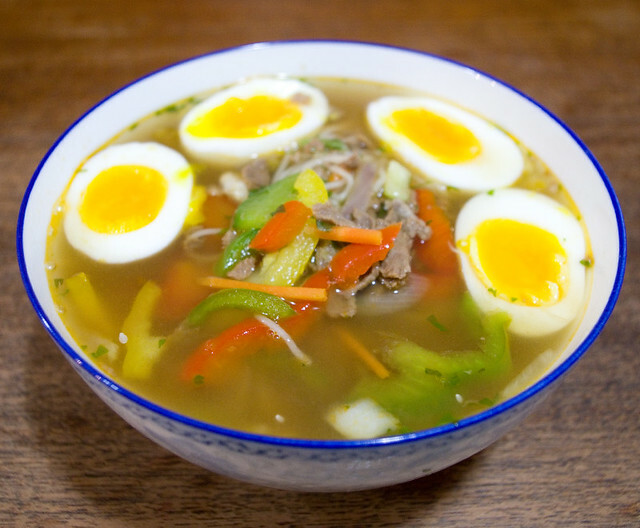 At the very least, I think I’ll be waiting for autumn to start making my own broth — since it takes so long and so much boiling, it doesn’t seem wise to start cooking broth during the dog days of summer if I can avoid it. Thirteen years ago, I went to Japan for a month-long visit. For most of that time, I was with my friend Michelle, who is a childhood friend from Canada who was teaching there. Together we traveled by train from Saga in the southwest along the coast to Tokyo over the course of three weeks, stopping many times along the way. One of our stops was to visit a young woman named Ayako Koyama and her family. Ayako had stayed with me back in high school as part of an exchange program; she’d also come to visit me as an adult about a year before. On this trip, I had the opportunity to meet her family and to get to know the home and the region where she had grown up. Ayako, Mrs. Koyama, Mr. Koyama, Ayako’s grandfather, Ayako’s grandmother, and Michelle. Ayako’s brother must have been at work that night. 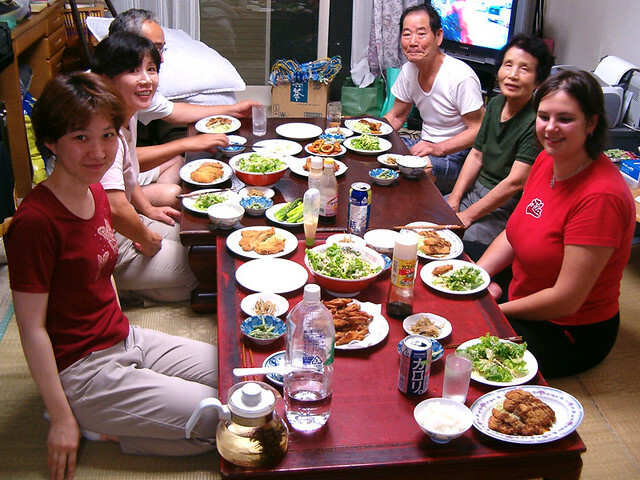 One evening, Ayako’s mother brought Michelle and I into her kitchen to teach us how to make katsu for dinner. I honestly can’t remember if it was chicken (torikatsu) or pork (tonkatsu) that we breaded and deep-fried, but I do remember the process! I was rummaging through my old photos yesterday and realized that I actually had a photo of us all eating the dinner we’d made (above). It was a lot of fun, although it’s always awkward to cook in someone else’s kitchen — even when there isn’t a language barrier! It remains one of my fondest memories of visiting with Ayako and her family. My one regret is that I wasn’t really into cooking at the time, so I didn’t take the opportunity to learn more from a Japanese home cook firsthand. Such a valuable resource wasted! I guess I’ll just have to go back to Japan someday and learn more. These memories resurfaced recently when I saw a show on the Food Network that had a segment on some restaurant that makes a chicken katsu burger. I really had developed a liking for it in Japan (you can see one of the commercial meals that I had that included it in my Noodle Soup entry). It’s a real comfort food. Suddenly, I was craving chicken katsudon again. Although I’d made the meat part before and could pretty much remember how to do it without help, I had to Google for how to make the eggs correctly, since they’re not simply scrambled eggs. 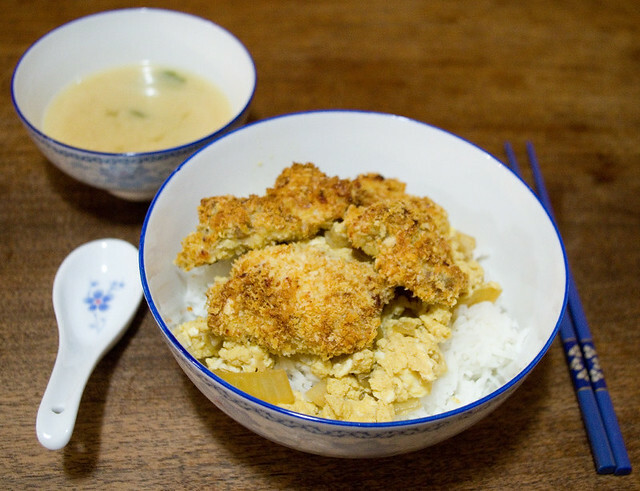 I used the Chicken Katsudon recipe from Just One Cookbook, and in an attempt to make it a little bit healthier I made Baked Katsudon instead of fried. I was pretty happy with how it turned out, although I know where I made some mistakes. I was running out of time at the end (I had to get the kids fed and out the door to Guiding), so I skipped cooking the chicken in the egg mixture and instead just put it on top, which made it a little bit dry. I think I cooked the egg a bit too long; when I had it in Japan it was just a little bit runny, more like a sauce than a scrambled egg. I also didn’t have any parsley, which would really have made it pop a bit more visually. Also, although I did manage to make up some miso soup, I ran out of time to make a salad, and a meal like this really needs some kind of veggie, even if it’s just a quick pickle. But given that it’s been thirteen years since I’ve attempted this dish, I don’t think it turned out too badly. It did get positive reviews from the family just how it was, so I am encouraged enough to try it again. 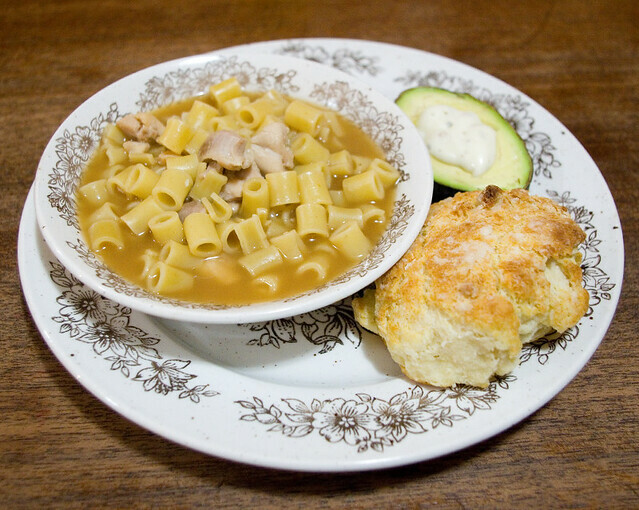 Last night the girls were off to Guiding, so I needed to make a quick and easy dinner. It was still wet and rainy, so I thought that it would be a nice idea to have some soup. I’ve been making a point of turning my frozen stockpile of bones (left over from roasts and rotisserie meals) into broth, so I used some of my recently-made chicken broth to make up some wonton soup. There wasn’t really a recipe as such. I threw some of the leftover chicken from Family Day, some baby bok choy, and a generous sprinkle of salt into the broth while I brought it to a boil. Then I added a couple of handfuls of fully-cooked chicken & cilantro mini wontons (bought at Costco) and cooked them for about two minutes. 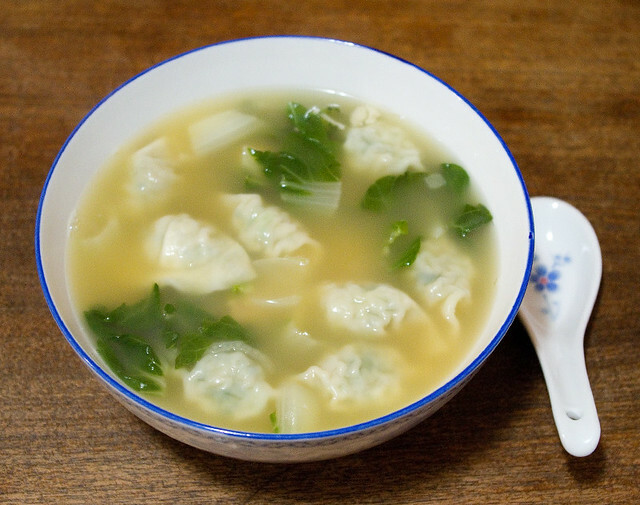 The broth didn’t need much seasoning because the wontons themselves are bursting with flavour — a very cilantro-based flavour, so I’m really lucky that none of us have that gene that makes cilantro taste like soap. And that was that! Earlier this week I accidentally bought two packages of pork riblets. I was distracted by the fact that each package was less than $2.00 and didn’t read the label very well; I thought that what was inside the package was solid meat instead of mostly bone. When I went to cook it I was highly disappointed! So I threw the bones into a crock pot and simmered them for two days in order to get a passable broth. When the meat was done, I set it aside and added the remaining simmering liquid (with the large particulate strained out), plus 1 tsp instant dashi granules and a drizzle of mirin, to a pot of the pork bone broth I’d made. The broth turned out nice and flavourful, but the pork belly still needs a bit of work; perhaps if I marinaded the pork belly in the liquid first, simmered it, then grilled it briefly to get some browning? I definitely need some more practice before I get it 100% right. In my ongoing quest for a better noodle, I served the pork and broth over a base of Kumai Japanese Style Handmade Ramen noodles by Chewy International Foods Ltd.. They’re still nothing close to fresh handmade noodles, but they have been the best pre-packaged noodles I’ve tried so far. You only have to cook them for 30 seconds in boiling water, which I think really helped them stay nice and chewy. 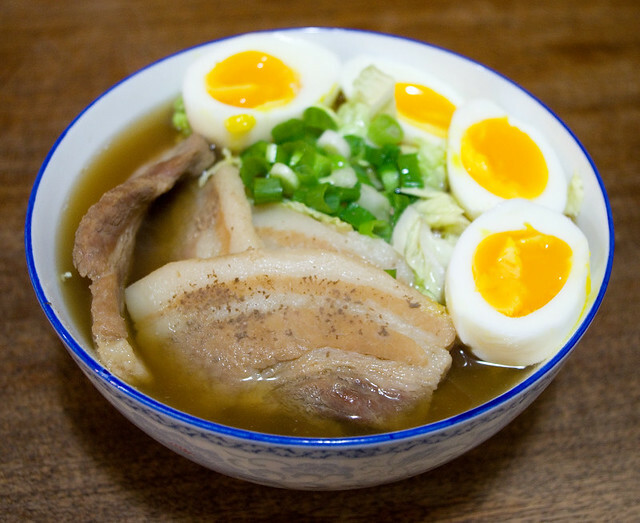 I served the ramen with shredded Napa cabbage, soft-boiled eggs, and green onions, in addition to the pork belly and broth I’d made. It wasn’t perfect, but it was quite tasty, and I enjoyed it. Too bad Thing 1 is down with a cold again and couldn’t really enjoy it, since it’s generally the kind of dish she prefers. At least the warm soup felt good on her sore throat. I love fresh noodles. I am endlessly fascinated by videos like the ones about making thread-thin suo noodles or precisely-cut Chinese spinach noodles or seemingly-effortless hand-pulled noodles (emphasis on “seemingly”). In Japan, I was lucky enough to be able to try fresh ramen and, I think, udon, but there may have been a bit lost in translation. Sadly, it’s hard to get fresh noodles of any style around here. There are a couple of specialty restaurants that make them, but for home use the closest I can get is refrigerated ones from the grocery store — and that’s only European styles. So until someone teaches me how to hand-pull noodles, or until I can afford an automatic pasta maker (or at the very least a hand-cranked pasta machine), I’m stuck with frozen or dried noodles. 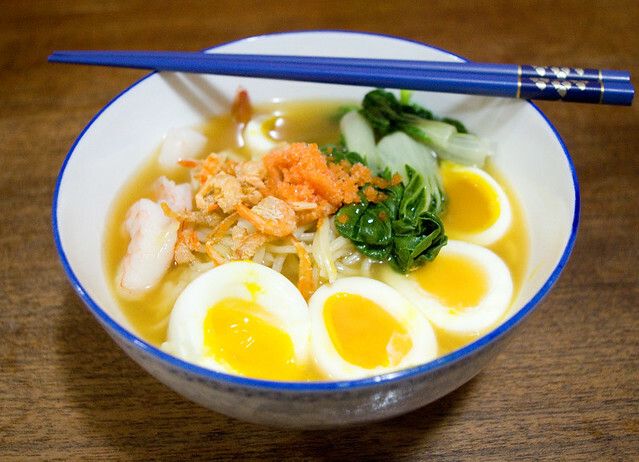 Frozen ramen that my husband prepared, topped with cooked shrimp, dried shrimp, baby bok choy, and soft-boiled eggs. The consistency of dried noodles doesn’t seem to bother my husband. Sure, he likes freshly-made pasta on the few occasions that we do get it, but he doesn’t crave the chewiness and strength of well-made ramen or udon. When he cooks ramen for dinner (and he always uses either instant broth or my homemade broth from the freezer), the consistency of the noodles doesn’t even cross his mind. 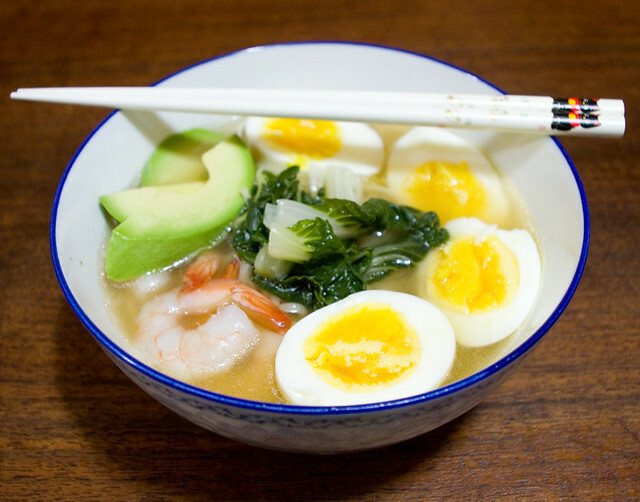 Frozen ramen that my husband prepared, topped with cooked shrimp, sliced avocado, baby bok choy, and soft-boiled eggs. That being said, he is willing to go along with my conviction that there are much better things out there. To that end, we’ve been trying out the other brands of ramen that are locally available, which admittedly aren’t very many. We started with dried noodles — not the ones in the instant noodle packets, but something very similar. The last two meals my husband made used Nissin Frozen Ramen Roodles in Artificial Pork Flavour. The noodles were a bit better than the dried kind, but not by much. The broth mix that went with the noodles actually had less flavour than the packets that come with instant noodles (and so far as I can tell they had just as much sodium). I think the lack of punch is funny considering that Nissin is the same company that makes our family’s preferred brand of instant noodle packet. If I have to eat a just-add-water soup, I prefer their Tonkotsu Artificial Pork Flavour with Black Garlic Oil. So I guess this frozen ramen was overall a bit better than the dried kind, but only a bit. I have another variety in my freezer left to try, though, before I head back to T&T to see if they have any others. As an aside, did anyone else use to eat dried ramen as a kid without cooking it first? It makes me cringe in retrospect, but we used to sprinkle the dried sauce packet over the top and eat it as is. I was reminded of this recently when I noticed that one of the local grocery stores had instant ramen on sale for 27¢ a packet, and I realized how happy this would have made me as a child, or as a broke college student for that matter. How my teeth survived unbroken I’ll never know. Over the weekend I tried my hand at Toshikoshi Soba, which according to the Internet means “year-crossing noodle“, or “end the old year and enter the new year soba noodles“. 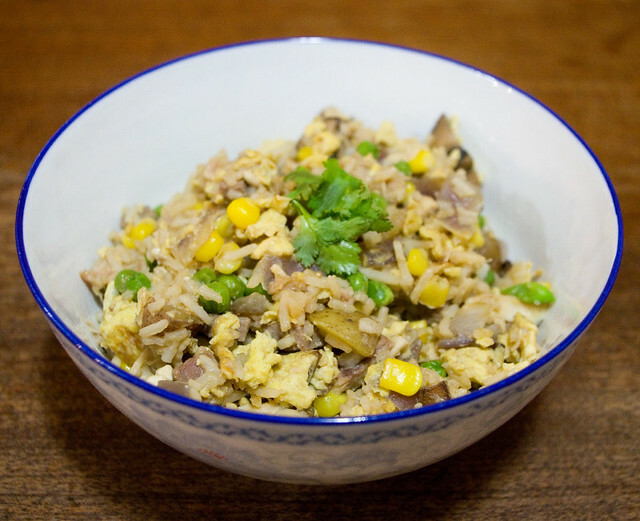 Basically, it’s a dish that is traditionally eaten on New Year’s Eve while waiting to ring in the new year. I didn’t actually find out about this dish until after the holiday, which turned out all right in the end because I wasn’t well enough to cook anything that night. At any rate, it’s not something that can only be eaten that day of the year. 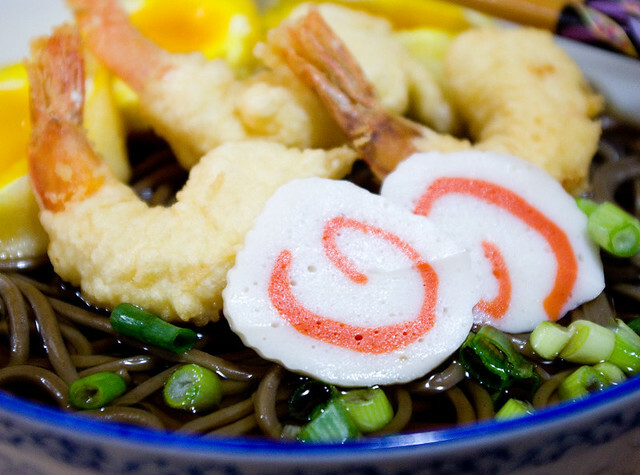 The recipe that I made was Tempura Toshikoshi Soba from Tasty Japan (also available on YouTube). If you’re like me and don’t read enough Japanese to get through a recipe, you can find the English translation in the second comment on their Facebook video. Or you can run it through Google Translate, which yields very undependable results, like directing you to “make tempura clothes”. 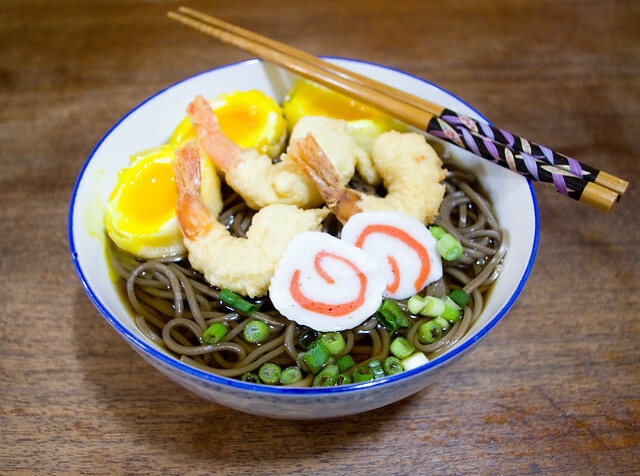 I added a bit more shrimp and soft-boiled eggs to each bowl that the recipe calls for, just because my family is absolutely smitten with tempura. I also used narutomaki (fish cake with the swirl in the middle) instead of kamaboko (the fish cake with the pink edge used in the Tasty Japan video), not only because I like the look of it, but also because it was literally the only kind of fish cake that was left at T&T. The fridge that usually holds it was completely empty except for two stray packages of narutomaki, so I went with that. I was really proud of myself when this dish turned out so well, mostly because it was the first time that I’d made tempura. Actually, it was the first time I’ve ever deep-fried anything! Apparently I still have to master the art of cutting tempura-coated soft-boiled eggs in half without destroying them, but they still tasted just fine. It really wasn’t as difficult to prepare toshikoshi soba as I’d feared, even though I think I dirtied every large pot in my kitchen by the end of cooking. My whole family devoured their soup. I loved the flavour of it all together. 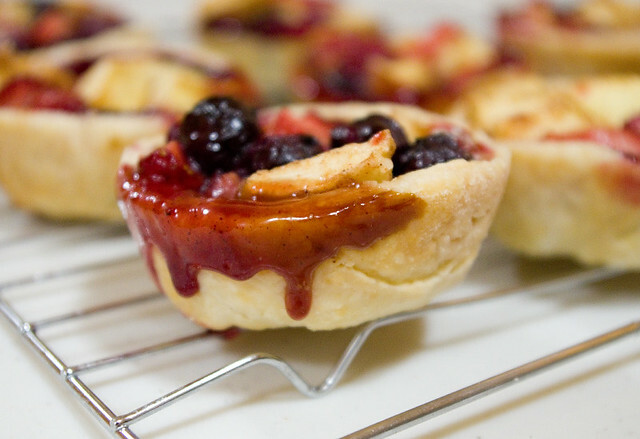 I am definitely making this again soon — and I won’t be waiting for next New Year’s Eve. Although I may serve it then too.